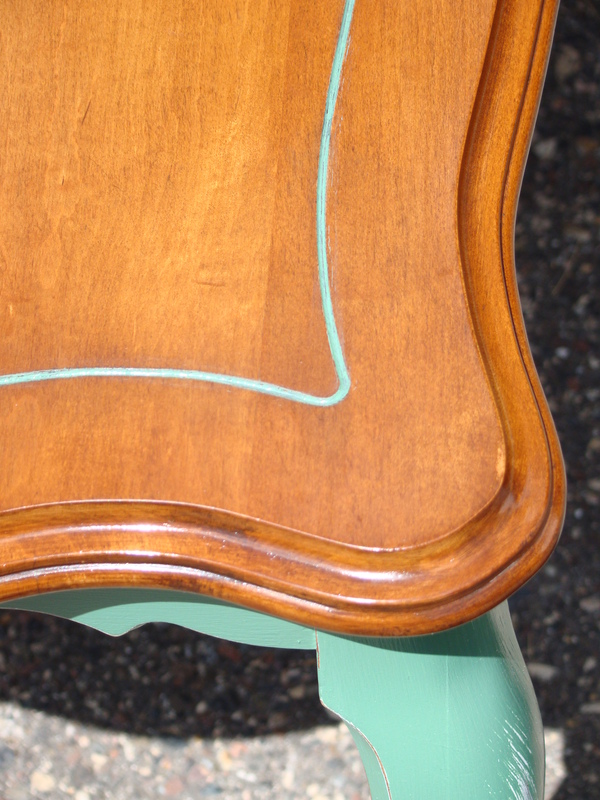 Sometimes, when you find an old piece of furniture to paint, upgrade or otherwise re-do, it just doesn’t make sense to cover the entire thing in paint. That was the case with this two-level side table I found recently. This table was actually in pretty good shape, aside from a few scratches from light use over the years. But, the bottoms of the legs looked like they had gotten wet at one time, leaving the wood discolored. 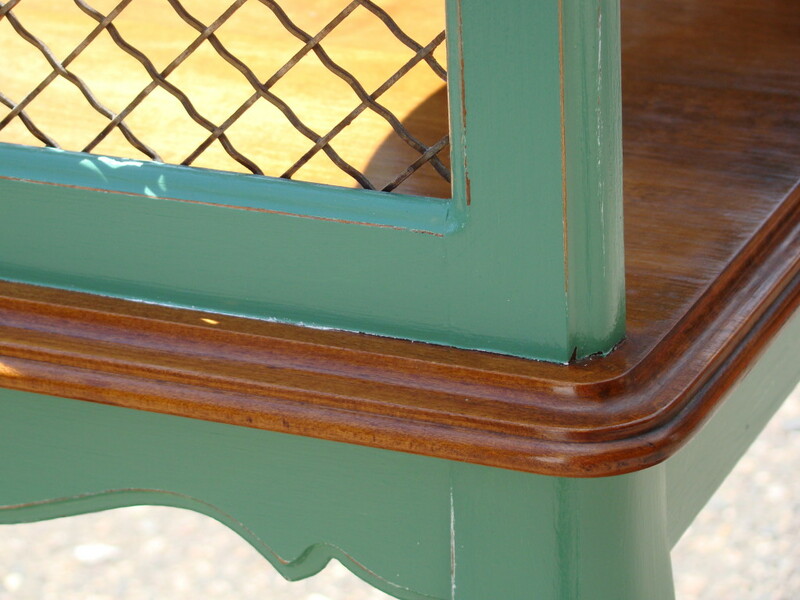 The table tops, however, looked great, so I decided to paint just the base of the table, leaving the wood tops intact. First, I gave the base parts a light sanding to rough up the original finish a bit. After wiping the dust off of the piece, I taped off the edges of the table so I could paint the legs without making a mess on the tops. I painted on a coat of primer, then 3 coats of paint in a fresh, green hue. It still didn’t look “finished.” So, I decided to add a bit of distressing, and added a stripe of green paint inside the existing recessed detail on the large table top. 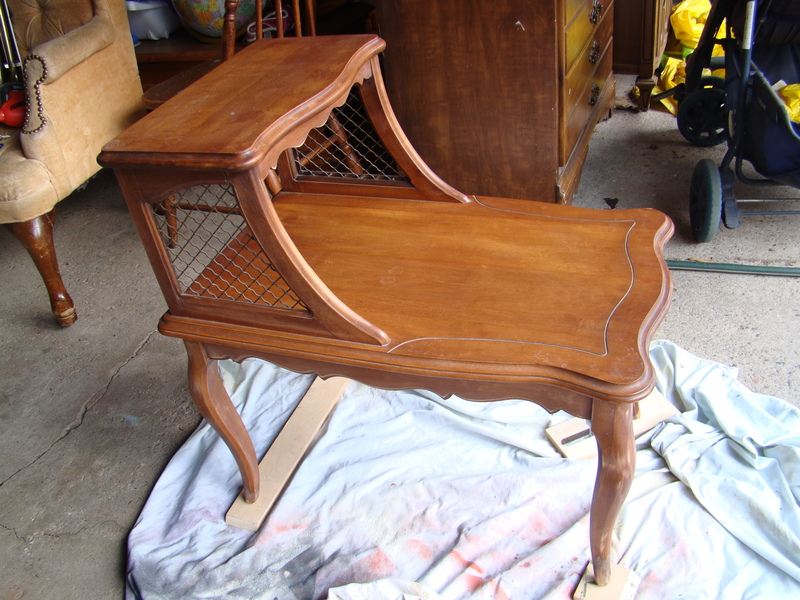 I used sandpaper to remove a bit of the paint at the edges of the legs and base – anywhere that natural wear could have occurred while the table was in use. This exposed both the wood underneath, which tied the base in beautifully with the wood tops, and the white primer…giving the entire piece an aged look. A coat of polyurethane finish to protect the surface, and this piece was done! I used a bit of Old English on the tops to revitalize the surface. I love the metal detail on this table, although it did complicate the painting process a bit. I had to use a very small paint brush to get up close to the metal without slopping paint on it. What do you think? Would you add a piece like this to your home? 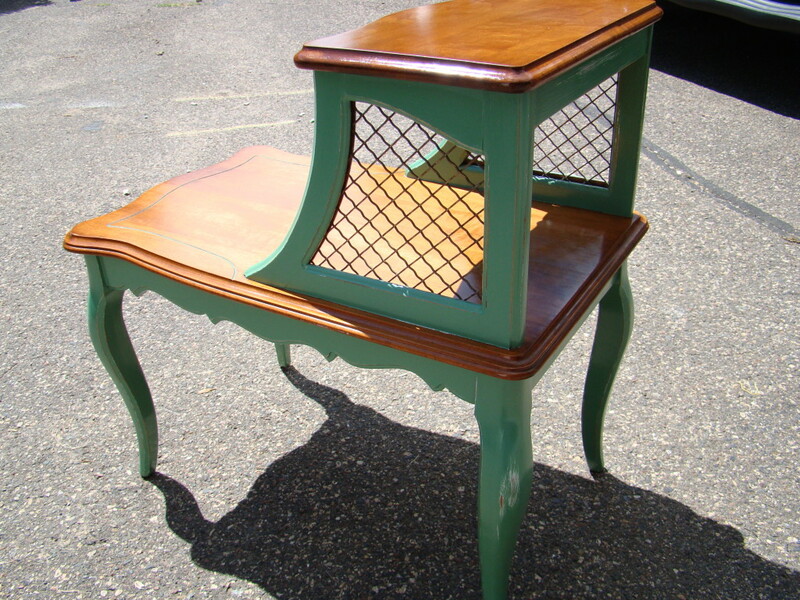 Sometimes, you don’t have to refinish the entire piece of furniture to make a huge impact!